Looking For Cheap Homemade Christmas Gifts? Finding ideas for cheap homemade Christmas gifts can often be difficult, as it can be hard to know what your spouse, kids, or relatives might enjoy. No doubt you can think of an occasion when you just couldn’t come up with that perfect gift for your husband or wife, and you ended up buying them something mediocre out of desperation to get them a Christmas present. With Christmas just one month away, you may already be biting your fingernails as you realize that you have absolutely no idea what Christmas presents your loved ones might like. If you have no idea what to get for your busy housewife, salesman husband, or student child, you may want to consider a dry erase wall calendar. This is one of the best personalized gifts that you can make for your family member, as it is a gift that you can decorate and make as fancy as you want without detracting from the inherent practicality of the gift. You will find that your spouse or child will be incredibly grateful for the erasable wall calendar, as it gives them a great way to organize their day, week or month in a concise and easy way. Of all the cheap homemade Christmas gifts, you may find that the personalized erasable wall calendar is one of the best. The calendar itself is just a whiteboard with a bit of decoration. You place an empty monthly calendar template on the whiteboard, add your decorations and that's it! You will find that it will be incredibly handy for your family members, as they are able to mark down all of the important dates and tasks that they need to keep. No doubt you already have a forgetful family member in mind or someone that will benefit greatly from the ability to organize their days easily and instantly with this cute personalized gift. Of all the cheap homemade Christmas gifts, this one is actually one of the easiest to make. It is one of the most practical gifts that you can give. Buy an 18" x 24" photo frame. It doesn’t have to be fancy or expensive. Look for frames that are on sale. Create an empty monthly calendar template. Here is a free printable monthly calendar template (right click on the mouse to save it) I made as a gift especially for you . I have added another template for notes. Place the empty template on the board and decorate it. You can add letters, flowers, decorations, scrapbook paper, sparkling stones, or whatever else you want to use as a decoration. Draw a short row at the top for the month. Put the personalized calendar in the frame and you're done! Don't forget to add a dry erase marker to your gift. As simple as that, you have a beautiful personalized dry erase wall calendar that your recipient can use in an instant. Using a dry erase marker, they can simply write the month and dates into the calendar every month. They can then organize their days as desired. The wall calendar is the perfect tool to use for many years to come. 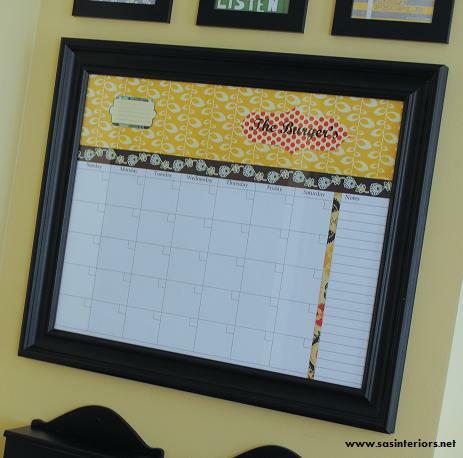 Create your own matching cork board to hang by the wall calendar. Make sure to reinforce the back of the thin cork board to ensure that it doesn’t get damaged after repeated use. Make your own message board with a matching frame, as that will provide your spouse with a place to hang messages to be added to the calendar. Create a “Shopping List" board where all of the weekly needs can be written up to make it easier when it comes time to do the grocery shopping. Making these additions in separate frames can give you a great way to decorate your office with practical and cheap homemade Christmas presents. Thanks for Jenna from SAS Interiors for the lovely idea.